Today's ride was mostly uneventful. 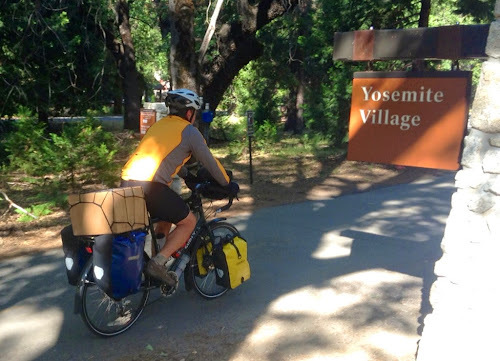 We didn't bike far, but we were able to get some of the elevation out of the way so that we don't have to climb all the way from Yosemite Valley to Tioga Pass in one day. We biked through a few tunnels. Narrow and dark, they didn't exactly set the stage for stress-free riding. Alas, we managed to get through them just fine. 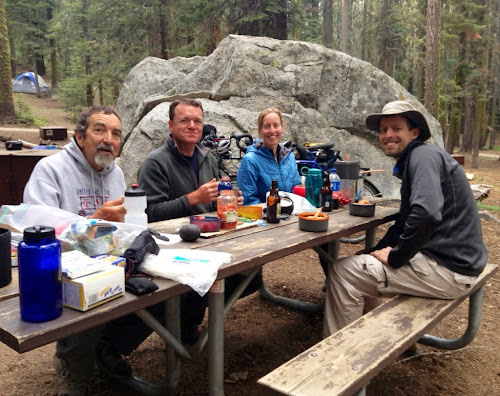 Fortunately, we made reservations for a campsite at the Crane Flat Campground, in Yosemite, a few days ago. 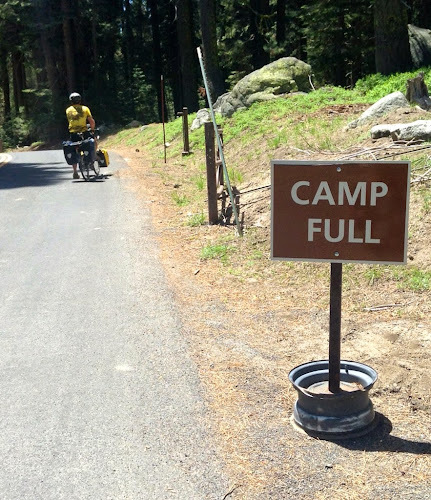 We've come to learn that unless you're diligent about making reservations in advance, you'll mostly likely be turned away by the "Camp Full" sign at the entrance to all the Yosemite campgrounds. 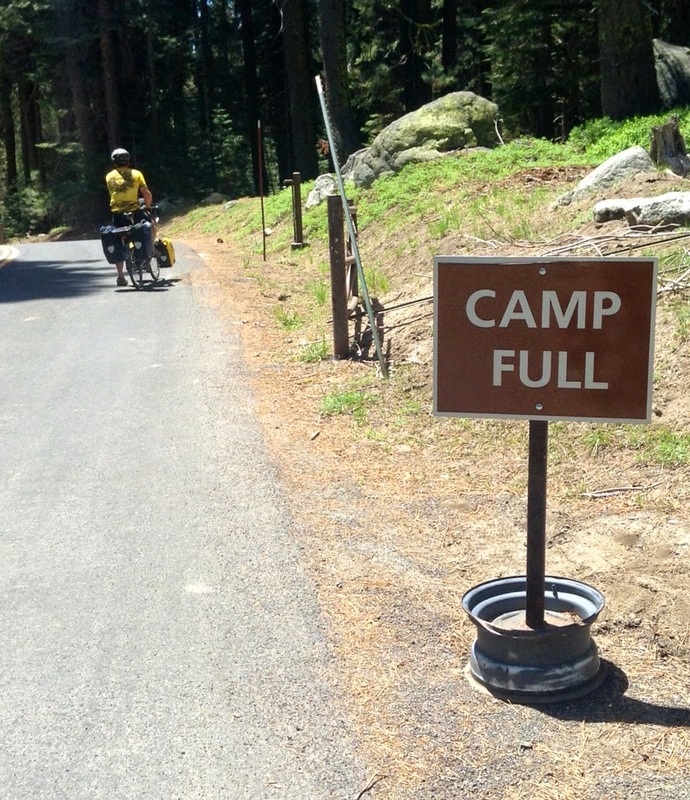 The camp is full, but we have a reservation! 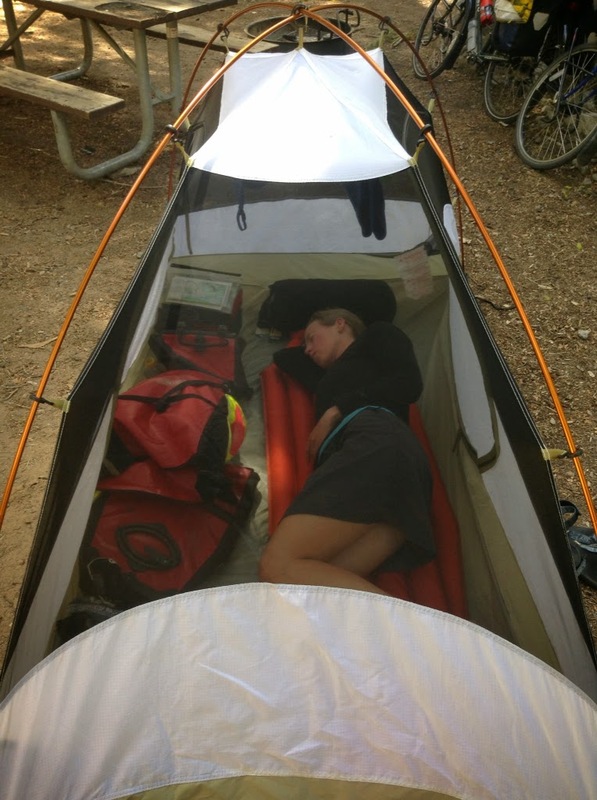 After yesterday's hike, I was very much looking forward to an afternoon nap. It didn't take long to fall asleep. After the nap, it was time to give Shirley some love. Most importantly, I wanted to check my brake pads to make sure that they were in good shape for the steep descent from Tioga Pass tomorrow. The brake pads show signs of wear, but they still have some life in them. I then checked my chain for chain stretch. Again, my chain has stretched a bit, but not enough to warrant replacing the chain. So...that meant cleaning and lubing my existing chain -- a task that I try and do every few days. Cleaning and lubing my drivetrain. Alex always used to make fun of Shirley's dirty drivetrain. 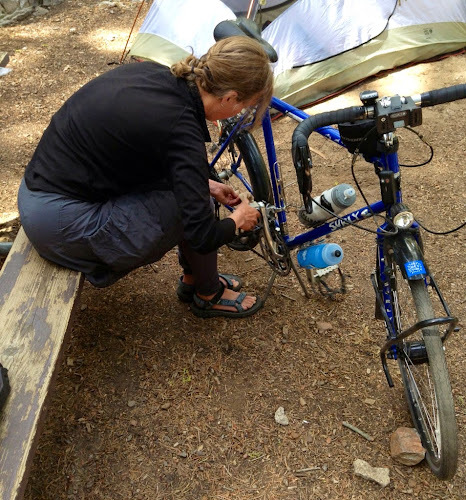 But now that Alex has experienced bike touring, I think he has a new appreciation for how quickly drivetrains get dirty while touring. It's a worthless battle to attempt to keep a drivetrain any color other than black. 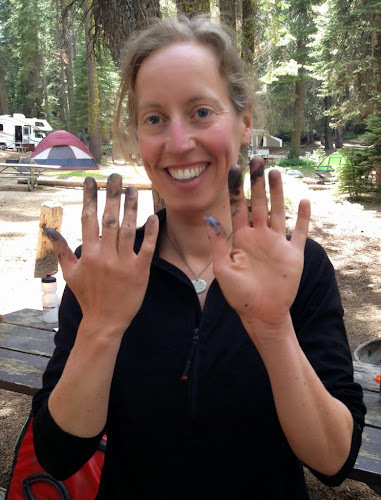 A dirty drivetrain, of course, leads to dirty hands. Soap, water, and a bunch of scrubbing should clean these puppies. In the late afternoon, BJ and Lilia arrived into camp. We made a pasta dinner, and then us cyclists turned to our tents for the night. While it was great fun spending the last few days in Yosemite Valley, it feels good to be on the road again. No more hot food for you guys :( I have a feeling that somebody will offer you guys hot food within 8 days.